Love Island’s Laura Anderson has been accused of stealing Olivia Attwood’s style once again. The Islander’s latest post to Instagram shows her lounging in her nightwear, wearing glasses with her hair styled in a high ponytail – looking a lot like last year’s contestant Olivia. 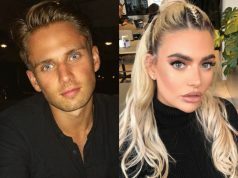 This isn’t the first time the 29-year-old has been accused of trying to copy Olivia, as throughout the series viewers repeatedly called her out.